Situated inside a beautiful 19th century building, the Best Western Premier Opera Opal offers a pleasant and relaxing atmosphere in a contemporary setting. This boutique hotel features a privileged location close to the city's most beautiful museums and monuments, as well as luxury shopping. 33 well appointed guest rooms, including two suites, feature flat-screen TVs, free Wi-Fi, minibars and more. Enjoy a delicious breakfast each morning, and cocktails in the evening around the open fireplace in the lounge bar. 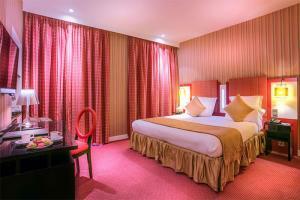 This hotel is about a 16 miles from Charles de Gaulle Airport and 15 miles from Orly Airport. Gare St. Lazare is less than a quarter of a mile away.